Original Editors - David Pieschel & Craig Satterley from Bellarmine University's Pathophysiology of Complex Patient Problems project. Data from the United States show that musculoskeletal tuberculosis primarily affects African Americans, Hispanic Americans, Asian Americans, and foreign-born individuals. The number of patients with TB spondylitis in Japan also declined to 233 in 2005 from 734 in 1978 and 276 in 2001. Although some studies have found that Pott’s disease does not have sexual predilection, the disease is more common in males. The male to female ratio is reportedly 1.5-2:1. In the United States and other developed countries, Pott’s disease occurs primarily in adults. In underdeveloped countries which have higher rates of Pott’s disease, involvement in young adults and older children predominates. Approximately 10% of Pott's disease cases involve the cervical spine. Back pain is the earliest and most common symptom. Patients with Pott’s disease usually experience back pain for weeks before seeking treatment and the pain caused by spinal TB can present as spinal or radicular. Although both the thoracic and lumbar spinal segments are nearly equally affected, the thoracic spine is frequently reported as the most common site of involvement. Together, thoracic and lumbar involvement comprise of 80-90% of spinal TB sites. Almost all patients with Pott’s disease have some degree of spine deformity with thoracic kyphosis being the most common. Cervical spine TB is a less common presentation occurring in approximately 10% of cases, but is potentially more serious because severe neurological complications are more likely. This condition is characterized by cervical pain and stiffness and symptoms can also include torticollis, hoarseness, and neurological deficits. Upper cervical spine involvement can cause rapidly progressive symptoms and neurologic manifestations occur early, ranging from a single nerve palsy to hemiparesis or quadriplegia. Retropharyngeal abscesses occur in almost all cases. In lower cervical spine insults, the patient can present with dysphagia or stridor. The clinical presentation of spinal tuberculosis in patients infected with the human immunodeficiency virus (HIV) is similar to that of patients who are HIV negative; however, spinal TB seems to be more common in persons infected with HIV. 62-90% of patients with Pott's disease are reported to have no evidence of extraspinal tuberculosis, further complicating a timely diagnosis. The duration of treatment is somewhat controversial. Although some studies favor 6 to 9 month course, traditional courses range from 9 months to longer than 1 year. The duration of therapy should be individualized and based on the resolution of active symptoms and the clinical stability of the patient. The main drug class consists of agents that inhibit growth and proliferation of the causative bacteria. Isoniazid and rifampin should be administered during the whole course of therapy. Additional drugs are administered during the first two months of therapy and these are generally chosen among the first-line drugs which include pyrazinamide, ethambutol, and streptomycin. The use of second-line drugs is indicated in cases of drug resistance. Highly active against Mycobacterium tuberculosis. Has good GI absorption and penetrates well into all body fluids and cavities. For use in combination with at least one other antituberculous drug; inhibits DNA-dependent bacterial but not mammalian RNA polymerase. Cross-resistance may occur. Bactericidal against M tuberculosis in an acid environment (macrophages). Has good absorption from the GI tract and penetrates well into most tissues, including CSF. Has bacteriostatic activity against M tuberculosis. Has good GI absorption. CSF concentrations remain low, even in the presence of meningeal inflammation. Injection of a purified protein derivative (PPD). Results are positive in 84-95% of patients with Pott’s disease who are not infected with HIV. Microbiology studies are used to confirm diagnosis. Bone tissue or abscess samples are obtained to stain for acid-fast bacilli (AFB), and organisms are isolated for culture and susceptibility. CT-guided procedures can be used to guide percutaneous sampling of affected bone or soft tissue structures; however, these study findings are positive in only about 50% of the cases. CT scanning provides much better bony detail of irregular lytic lesions, sclerosis, disk collapse, and disruption of bone circumference. Low contrast resolution provides a better assessment of soft tissue, particularly in epidural and paraspinal areas. CT scanning reveals early lesions and is more effective for defining the shape and calcification of soft tissue abscesses which is common in TB lesions. MRI is the criterion gold standard for evaluating disk-space infection and osteomyelitis of the spine and is most effective for demonstrating the extension of disease into soft tissue and the spread of tuberculous debris under the anterior and posterior longitudinal ligaments. MRI is also called the most effective imaging study for demonstrating neural compression. MRI findings useful to differentiate tuberculosis spondylitis from pyogenic spondylitis include thin and smooth enhancement of the abscess wall and well-defined paraspinal abnormal signal, whereas thick and irregular enhancement of abscess wall and ill-defined paraspinal abnormal signal suggest pyogenic spondylitis. 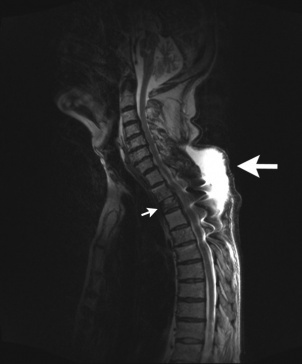 Thus, contrast-enhanced MRI appears to be important in the differentiation of these two types of spondylitis. Use of a percutaneous CT-guided needle biopsy of bone lesions can be used to obtain tissue samples. This is a safe procedure that also allows therapeutic drainage of large paraspinal abscesses. PCR techniques amplify species-specific DNA sequences which is able to rapidly detect and diagnose several strains of mycobacterium without the need for prolonged culture. They have also been used to identify discrete genetic mutations in DNA sequences associated with drug resistance. The organism that has been identified as causing Pott’s disease is mycobacterium tuberculosis. The primary mode of transmission the bacteria travels to the spine is hematogenously from an extraspinal site of infection. It is common to travel from the lungs in adults but the primary site of infection is often unknown in children. The infection has also been found to spread through the lymphatic system. Once being spread, the infection can target vertebrae, intervertebral discs, the epidural or intradural space within the spinal canal and adjacent soft tissue. When the infection is developing, it can spread up and down the vertebral column, stripping the anterior and posterior longitudinal ligaments and the periosteum from the front and sides of the vertebral bodies. This results in loss of the periosteal blood supply and distraction of the anterolateral surface of the vertebrae. If a single vertebra is affected, the surrounding intervertebral discs will remain normal. However, if two adjacent vertebrae are affected, the intervertebral disc between them will also collapse and become avascular. Due to the vascularity of intervertebral discs in children, the discs can become a primary site of infection rather than spreading from the vertebrae. Spinal cord compression in Pott’s disease is usually caused by paravertebral abscesses which can also develop calcifications or sequestra within them. If the infection reaches adjacent ligaments and soft tissues, a cold abscess can also form. Abscesses in the lumbar region may descend down the sheath of the psoas to the femoral trigone region and eventually erode into the skin. Other causes of neurological involvement include dural invasion from granulation tissue, sequestrated bone, intervertebral disc collapse or a dislocated vertebra. Neurological symptoms can occur at any point, including years later as a result of stretching of the spinal cord within the vertebral foramen of the deformed spine. The severity of Pott’s disease varies from one person to another, resulting in different clinical presentations. Possible signs and symptoms that may present are depicted in Table 1 by system. Effective chemotherapy for Pott’s disease is the gold standard and must be started at the early stages of the disease. Radical ventral debridement, fusion and reconstruction of the vertebral column remains the gold standard of surgical treatment for tuberculosis spondylitis. Multiple surgical approaches have been conducted to correct the spinal deformity seen in Pott's disease with varying results. Laminectomy failed to address the anterior component of the disease process and spinal instability. Posterior fusion has been successful at reducing kyphosis but preoperative infection and high levels of kyphosis have resulted in many fusion failures. An anterior approach, used by Hodgson and Stock, has also been used with great success. Various surgical techniques are utilized based on which area of the spine is affected. In the upper cervical spine, a transoral or extreme lateral approach is taken which typically requires concurrent occipito-cervical fusion to prevent collapse, instability and delayed deformity. Midcervical lesions are often treated with standard anterior cervical approaches and achieve excellent results. Transsternal, transmanubrial, or lateral extracavitary approaches are conducted in patients with involvement of the lower cervical/upper thoracic spine. In the thoracic spine surgeons make use of transthoracic, extraplural anterolateral or extended posterolateral approaches. The posterolateral method ismore often utilized in severe cases of kyphosis due to the natureof the spinal deformity and ease of access to the spine. However, surgical correction of a severe kyphotic deformity (>30 degrees) will often require a posterior technique that is complex and technically demanding. Surgical morbidity and mortality can be significant for these technically demanding procedures with ;an 8-10% incidence post correction neurological complications. Surgical procedures in the lumbar spine are typically performed through a lateral retroperitoneal approach which is the preferred method compared to an anterior or retroperitoneal procedure. Surgery done during the active course of the disease is much safer with a faster and better response. Moreover, the importance of early diagnosis, start of appropriate treatment and its continuation for adequate duration along with the proper counseling of the patient and family members with the timely surgical intervention is the key for the success in achieving a good outcome. Patients with Pott's disease often undergo spinal fusion or spinal decompression surgeries to correct their structural deformity and prevent further neurological complications. There are no established guidelines which dictate treatments that will yield positive outcomes in such patients. However, treatment regimens should address each patient individually, focusing on any impairments, functional limitations and/or disabilities with which they present. When compared with other physical therapy treatments and self-managment, spinal stabilization exercises were found to produce significantly more positive ratings in global outcomes. Pain and disability, however, did not show significant improvement when compared to the other two treatment options. Studies examining the use of TENS have shown higher frequencies are more effective in decreasing neuropathic pain. Aerobic exercise, PT, and trunk strengthening interventions have all attained significant decreases in pain, psychological distress and disability. Sarangapani A, Fallah A, Provias J, Jha NK. Atypical presentation of spinal tuberculosis. Canadian Journal of Surgery. 2008 December; 51(6): E121. A 26 y/o male presented with a 4 month history of pain in the right shoulder and ribs, thoracic and lower extremities numbness and weakness. All characteristics were consistent with a neoplasm but was ultimately identified as spinal TB. Ringshausen FC, Tannapfel A, Nicolas V, Weber A, Duchna H, Schultze-Werninghaus G, et al. A fatal case of spinal tuberculosis mistaken for metastatic lung cancer: recalling ancient Pott's disease. Annals of Clinical Microbiology and Antimicrobials. 2009; 8: 32. A 67 y/o male of Germanic descent presented to ER with complaints of severe mid back pain and no prior history of TB. He was originally treated for metastatic lung cancer based on a single lung nodule, but the diagnosis was incorrect. Shortly after the diagnosis was correctly identified, the patient passed away. Jeon DW, Chang B, Jeung UO, Lee SJ, Lee C, Kim M, et al.A Case of Postoperative Tuberculous Spondylitis with a Bizarre Course. Clinics in Orthopedic Surgery. 2009 March; 1(1): 58–62. A 44-year-old man, who had a history of complete recovery from pulmonary tuberculosis 20 years previously, underwent posterior interbody fusion with instrumentation for a herniated intervertebral disc at the L4-L5 level. He developed a fever and low back pain at three weeks postoperative. No labs were taken and after 3 months of antibiotics, he was diagnosed with spinal tuberculosis. Adegboye OA.Non-Hodgkin's lymphoma “masquerading” as Pott's disease in a 13-year old boy. Indian Journal of Medical and Paediatric Oncology. 2011 Apr-Jun; 32(2): 101–104. A 13 year old boy presenting with back inflammation, lower extremity paralysis, bowel and bladder incontinence, progressive weight loss, numbness below T10 and low grade fever. Radiographs taken indicative of Pott's disease. Wong NM, Sun LK, Lau P.Spinal infection caused by Mycobacterium avium complex in a patient with no acquired immune deficiency syndrome: a case report. Journal of Orthopaedic Surgery. 2008; 16(3): 359-63. 60 y/o male presents with 6 months of back pain with no reported trauma. He has hypertension and gout, but is not diabetic, immunocompromised or using steroids. Diffuse tenderness over mid lumbar region and no signs of neurological involvement and is afebrile. Common lab values and imaging confirmed diagnosis of spinal TB. Lotfinia I, Vahedi P.Late-onset post-diskectomy tuberculosis at the same operated lumbar level: case report and review of literature. European Spine Journal. 2010 July; 19(Suppl 2): 226–232. A 43 y/o male presents with chronic low back pain for 4 months with intermittent pus drainage from his scar status post lumbar discectomy 8 years previously. Patient reported no history of TB but he had worked as a secretary at a hospital for years. ↑ 1.00 1.01 1.02 1.03 1.04 1.05 1.06 1.07 1.08 1.09 1.10 1.11 1.12 1.13 1.14 1.15 1.16 1.17 1.18 1.19 1.20 1.21 1.22 1.23 1.24 1.25 Hidalgo JA, Cunha BA. Medscape Reference [Internet]. WebMD. Updated 2011 Dec 5. Accessed 2012 Mar 28. Available from: http://emedicine.medscape.com/article/226141-overview#a0104. ↑ 2.0 2.1 2.2 2.3 2.4 Cherian A, Thomas SV. Central nervous system tuberculosis. Afr Health Sci. 2011 (1): 116-127. ↑ 3.0 3.1 3.2 3.3 Benzagmout M, Boujraf S, Chakour K, Chaoui M. Pott’s disease in children. Surgical Neurology International. 2011; 2(1). 1-5. ↑ Goodman CC, Snyder TES. Differential Diagnosis for Physical Therapists: Screening for Referral. 4th ed. St. Louis, MO: Saunders Elsevier; 2007:345. ↑ 5.0 5.1 Nagashima H, Yamane K, Nishi T, Nanjo Y, Teshima R. Recent trends in spinal infections: retrospective analysis of patients treated during the past 50 years. International Orthopaedics. 2010; 34(3): 395-399. ↑ 6.0 6.1 6.2 6.3 6.4 6.5 Kumar R, Srivastava K, Tiwari RK. Surgical management of Pott’s disease of the spine in pediatric patients: A single surgeon’s experience of 8 years in a tertiary care center. Journal of Pediatric Neurosciences. 2011; 6: 101-108. ↑ 8.0 8.1 8.2 8.3 8.4 8.5 8.6 Khoo LT, Mikawa K, Fessler RG. A surgical revisitation of Pott distemper of the spine. The Spine Journal. 2003; 130-145. ↑ Ringshausen FC, Tannapfel A, Nicolas V, Weber A, Duchna H, Schultze-Werninghaus G, et al. A fatal case of spinal tuberculosis mistaken for metastatic lung cancer: recalling ancient Pott's disease. Annals of Clinical Microbiology and Antimicrobials. 2009; 8: 32. ↑ Khoo LT, Mikawa K, Fessler RG. A surgical revisitation of Pott distemper of the spine. The Spine Journal. 2003; 130-145. ↑ Hpathy.com [Internet]. Update unknown. Accessed 2012 Mar 28. http://health.hpathy.com/potts-disease-symptoms-treatment-cure.asp. ↑ Schirmer P, Renault CA, Holodniy M. Is spinal tuberculosis contagious? International Journal of Infectious Diseases. Aug 2010; 14(8): 649-666. ↑ Mannion AF, Denzler R, Dvorak J, Muntener M, Grob D. A randomised controlled trial of post-operative rehabilitation after surgical decompression of the lumbar spine. Eur Spine J (2007) 16:1101–1117. ↑ Pons T, Shipton EA. Multilevel lumbar fusion and postoperative physiotherapy rehabilitation in a patient with persistent pain. Physiotherapy Theory and Practice. 2011; 27(3):238-245.